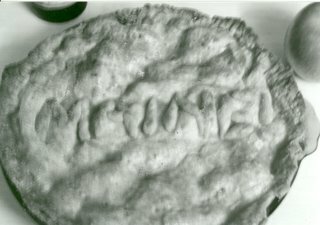 This is an apple pie I made and brought to my friend Jamie's cottage on Mt. Desert Island (Acadia) in Maine this summer. We warmed it in the crisper and over the course of 4 days, we ate it all. I like spelling things like 'Humble Pie'(to make people eat it) or '609'(for the residents of 609 Ann St.) or 'USA'(for the 4th of July) or 'Jesus' or making cool shapes on the crusts of my pies.